I went out for a 5 mile run at 3 a.m. in my town, a typical Long Island suburb. As I stepped out into the cool (very) early morning air, I faced my first obstacle: my house’s sprinkler system. I quickly analyzed the situation, and decided that the path of least risk involved edging along the side of the lawn and leaping over a sprinkler head. Two very wet legs later, and I was on my way. The sprinklers in front of my house seemed to set a theme for my run. As I headed down my block, a solitary figure reflecting off shiny wet asphalt, I noticed a sound filling the damp air. A sort of hum, a familiar swishing. I looked around and suddenly realized that every house on my block had their sprinklers on. The slight drizzle I had noticed was about half rain and half sprinkler mist, rain from the sky and ground (a Forrest Gump quote concerning ‘rain that goes up’ comes readily to mind). As I continued my run, every block I passed had houses with sprinklers going. I thought it so typical, the suburban houses with the tidy lawns and all the sprinklers set to turn on at 3 a.m. when no one is supposed to be around. And there I was, breaking the rule, observing the sprinklers quietly going about their solitary business. It almost felt like the rain was no rain at all but entirely sprinkler mist, their rebellion to my intrusion. But I took all the water, rain and sprinklers alike, in stride. And it was fitting when about a mile away from home I got thoroughly soaked by a sprinkler to which I got too close. The sprinklers, the suburban rain, had their final say. After a summer in Cambridge/Boston, I’m back home in New York. The end of my Boston trip also signified an end to my Boston running, a running scene which I sorely miss already. Below are the things I loved and hated about Boston running. 1. The other runners! And not just on Sunday mornings, they were hitting the roads at all times. There was a large diversity of runners too, from those clearly on their bi-monthly slog to Boston marathoners. 2. Scenery. Okay, Boston is not exploding with natural wonders, but it’s a nice city, and the Charles River is pretty. Plus, I have a suburb of New York to compare it to, so it doesn’t take much for me to be impressed. 3. The bridge loops. The popular loops around bridges on the Charles River are nice loops with easy-to-remember distances. They were an easy default when I was too lazy to map out a new route. 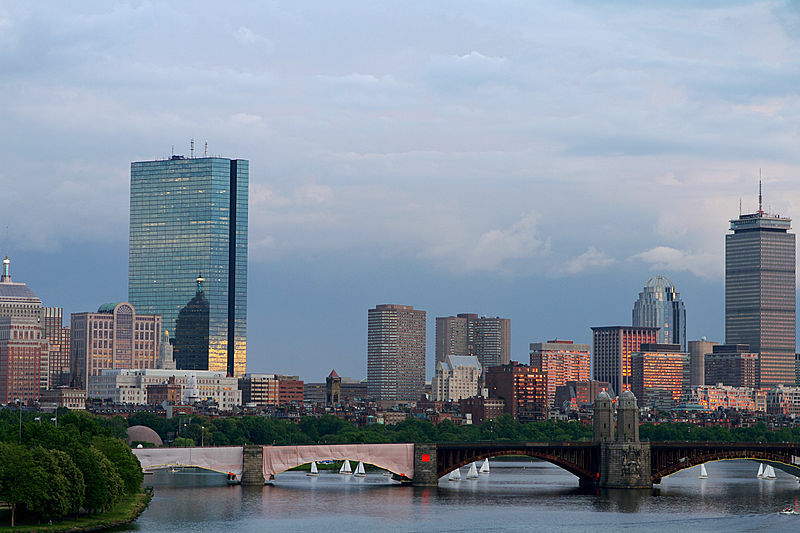 On a related note, I did manage to run just about every bridge over the Charles River within a 10 mile radius of Boston, an arbitrary goal of mine over the summer. Longfellow Bridge in Boston, spanning the Charles River. A member of the bridge loop club. Picture by Matthew Miller, Wikipedia Commons. 1. The weather. This is to New England in general, actually: Stop raining already! It especially liked to rain when I was already on the verge of not doing a run already because I was tired and didn’t feel well. And I wasn’t even there for the New England winter. 2. The pedestrians. Maybe it’s because Boston has so many runners, or maybe I was simply imagining it, but pedestrians in Boston tended to not yield to runners. Some of them were good about it, quickly clearing a path, but others hardly moved, if at all. Maybe I simply had higher expectations for a running city, because now that I think about it I doubt New York is any better. 3. The god-damn street names. I swear to god, the city planners must have been smoking something when they laid Boston out. Mapping a run one day, I noticed Washington Street crossing Washington Street which a couple of hundred feet later crossed, you guessed it, Washington Street. This was by FAR the most frustrating aspect of running in Boston, and it was responsible for some rather painful extended runs. Overall, though, the good outweighs the bad, and I’m hoping to do some more Boston running soon. I have never been a part of any running group. Not the small local club, not the somewhat larger New York Road Runners. So when I joined a running group based in Cambridge for a run this past Saturday, it was an entirely new experience. And a great one, at that. After being in Cambridge for over a month and running nearly every day of my stay here, it finally occurred to me that I should check out running clubs nearby. After all, Boston is practically swarming with runners, and it is only natural that they on occasion get together for some of that running. About a minute and a half into searching the interweb, I found a group that met three times a week about two minutes away from where I’m currently staying. After a short email exchange with the club I found myself with the group bright and early Saturday morning. The group largely stayed together for the first mile, then broke up into pairs (mostly) who ran their own pace and distance around the Charles River. I’ll always maintain that running is a solo sport at its heart, but running with a partner can be extremely helpful. The fellow I ran with was right around my fitness level, so we were well matched. The interesting thing about running in pairs is that crashing is rarely synchronous, which is actually a good thing. If one runner is struggling he can draw energy from the other and vice versa. When I’ve been on runs where my partner and I crash together, it is difficult, but even that can be psychologically helpful: sometimes it’s good to know that you’re not the only one having a hard time. I’m an advocate of running partners, clearly, and a running club seems to operate on the same principle. Logic dictates I should therefore like running clubs, which thus far appears to be accurate. I suppose I’ll know better after this Saturday, when I run with them again. The title is perhaps misleading. I did not see or do anything particularly adventurous on my 22 mile trek this past Sunday; rather it was the total experience of running 22 miles for the first time was the adventure. One morning recently I woke up and decided I would do an ultramarathon before my first marathon. Why? A couple of reasons: To prove to myself that I can, and to enjoy the distance before I decide to start seriously racing it. If I decide to train for a marathon, I will push myself to do it fast- which, of course, is not a bad thing, but is a different sort of experience. I know that if I decided to one day I could go out and run 26.2 miles (not today, mind you, my legs are still sore from the 22 miler). But I want to do a run where I don’t know starting out that I can finish the distance, where the worst-case scenario is not PR’ing. And that’s where ultras come into play. They make you race the distance, not the clock. Granted, this is all very up in the air, since I haven’t even signed up for an ultra yet, but it’s a good goal to focus on. The 22 miler was just part of my ongoing theme of “let’s see how far I can run until I drop from exhaustion” (which is probably the mantra of many a runner). I won’t put you through the same agony it put me through by giving you a blow by blow (or rather a mile by mile) description, but needless to say, it was hard. Not the hardest run I’ve ever done, but it was hot out and it was psychologically difficult knowing I’ve never run that far. The 20-mile barrier is completely mental- I’ve run 18, this was physically minimally harder (race pace, of course, every mile counts more)- but it felt nice to break it. Next up: the 30 mile barrier. Next week, maybe. Right now I’m enjoying a well-earned rest day.